Washington’s many scenic highways are frequented by thousands of motorcyclists every year. As the weather warms, more riders hit the road and take advantage of all the natural beauty our state has to offer. But every motorcyclist will tell you there’s risks as well. Whether it’s an unsuspecting driver or a reckless rider, crashes involving motorcycles are almost always severe. Following proper safety warnings is key, as well as knowing which roads to ride. 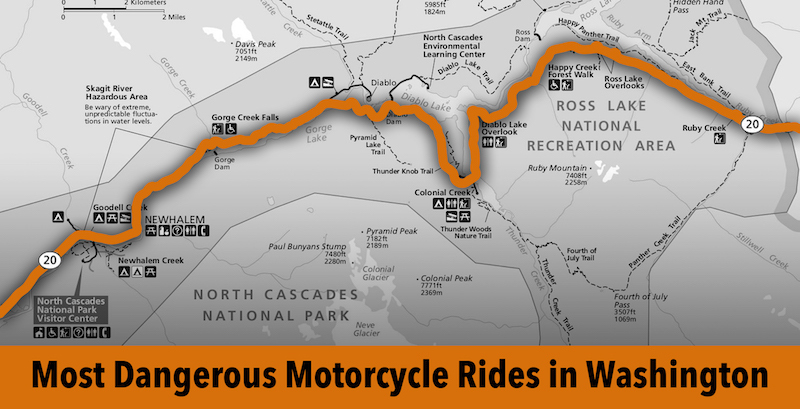 As motorcycle safety advocates we wanted to find out which scenic motorcycle routes in Washington state are the most dangerous for riders. We analyzed almost 4,000 motorcycle-involved collision records from 2016 through 2018 and compared them against the most popular scenic rides in the Evergreen State, according to MotorcycleRoads.com. We then assigned each route a “risk score.” A fatal crash is 5 points, an injury collision worth 3 points, and a non-injury crash worth 1. Stretching from the small town of Marblemount all the way to Winthrop, this stretch of State Route 20 is not for the faint of heart. The 65-mile ride climbs up to 5,477 feet through the northern Cascades. The road is extremely twisty, but is one of Washington’s hidden secrets. But don’t be blinded by the scenic views. This road — closed during the winter due to snow and avalanche danger — is never boring. From 2016 to 2018 there were six fatal motorcycle crashes, the most of any route on our list. Additionally, there were 21 injury incidents and two non-injury crashes, putting the North Cascades Highway firmly atop the list. The Washington State Department of Transportation has taken steps to make the highway closer for motorcycles. They added advanced curve warnings and arrow boards near notoriously tough curves as well as intersection warnings. They’ve also added a safety brochure to the area. While not nearly as dangerous as our No. 1 spot, Chinook Pass carries its own set of challenges for riders. Usually closed December through June, this route starts in Greenwater and follows Highway 410 into US 12 into Naches. With great views of Mt. Rainier, the 95 miles on Chinook Pass is not terribly hard for motorcyclists. But there have been a number of serious crashes involving riders in recent years. The route saw one fatal collision, 16 injury crashes and one non-injury incident over the past three years. And while it doesn’t have the same dangerous distinction of the North Cascades Highway, Chinook Pass should not be taken lightly. The 104-mile stretch goes all the way from Redmond to Leavenworth, a Bavarian-styled village in the Cascade Mountains in central Washington. Along the way riders will drive through Novelty Hill Road to reach West Snoqualmie Valley Road, then turn left and head straight on State Route 2. Up through Stevens Pass and with the Wenatchee River to take in, riders can expect a smooth ride. But the route is not without its challenges. In the three years studied, the Leavenworth Run had one fatal crash, 11 injury collisions and three non-injury events, firmly placing it at No. 3 on the list. This route starts in Bingen and ends in Lyle, both located along the Hood River in southern Washington. The ride is known as a loop because it almost makes a complete circle, heading up State Route 141, then BZ Glenwood Highway, Glenwood Highway, then down toward Route 142 and Highway 14. And while riders should keep an eye on their GPS for this route, the 80-mile stretch road has rough spots. Collision data shows that there was one fatal crash, nine injury collisions and zero non-injury incidents from 2016-18 on the Klickitat Loop. The road has a few long straightaways, some twisty sections, and lots of good switchbacks for riders looking for a thrill. From Bellingham, take State Route 542 and head northwest until you reach Mt. Baker. This route is 57 miles of bliss, and delivers you right up to the parking lot of Mt. Baker. At the base of Mt. Baker, riders can expect 15 miles of hairpin turns combined with a nature lover’s dream. While reaching the top is the ultimate goal, be careful on the way there. The trek to Mt. Baker makes our list due to the eight injury collisions and three non-injury crashes over the past three years. The most urban route on the list, Sunset Run in Federal Way and Tacoma is a great ride for those looking to take in the Puget Sound and Commencement Bay. At just 26 miles, it’s also far more manageable for someone looking for a quick ride. Beginning in Federal Way on Southwest Dash Point Way, travel south to the Port of Tacoma. A right on to Interstate 705 takes you to Ruston Way, bringing you along the water all the way to Port Defiance Park. Sunset Run had seven injury collisions and two non-injury crashes from 2016-18, but that shouldn’t deter riders from experiencing Tacoma in a new way. At just 19 miles long, Chuckanut Drive starts on the north end of Burlington and heads north to Fairhaven, a neighborhood of Bellingham. The ride has a variety of landscapes, including waterfalls, tideflats, and a great view of Puget Sound. And while it makes our list of riskiest motorcycle rides, the route had six injury collisions from 2016-18. At 98 miles long, this route goes from Joseph, Oregon, up to Clarkston, Washington on Highway 129. With five injury collisions in three years, this ride follows the Snake River and heads down into Oregon. Note: Collision data for the Washington portion of the route only. Among the longer of the trips on our list, this 123-mile route from Olympia to Seaside, Oregon, along the Washington coast offers some variety for riders. Take State Route 8 west toward Aberdeen, then head south on US 101 down the coast. And with four injury collisions and two non-injury events in three years, it's much safer than the rides that top this list. This 51-mile stretch from Castle Rock to the Johnston Ridge observatory goes right up to Mt. St. Helens. You’ll see rivers and lakes, including Silver Lake, Coldwater Lake and Spirit Lake. The route had just three injury collisions in the three years studied. Attorney Chris Davis believes every motorcycle accident victim begins their road to recovery by having up-to-date and accurate information about the legal process. 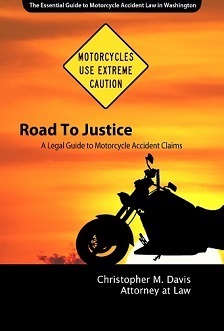 That’s why he wrote Road to Justice: A Legal Guide to Motorcycle Accident Claims. The book is intended to help injured victims who have been injured in motorcycle accidents in Washington State. In order to find the most dangerous motorcycle routes in Washington, we began by looking at the most popular rides for motorcyclists on motorcycleroads.com. We then compared those routes to all motorcycle-involved crashes in Washington State from 2016 through 2018, a three-year span, using Washington State Patrol collision data. We then ranked the routes based on the number of collisions, assigning them a "risk score" based on fatal crashes, injury crashes, and non-injury crashes.